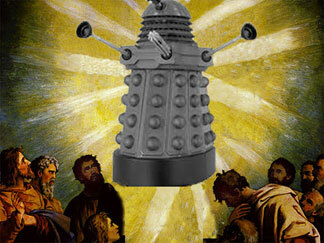 MOST SCIENCE FICTION IS IRRELIGIOUS — in most sci-fi stories, religion is simply not there. Some sci-fi novels, however, are implicitly or explicitly atheist: some have atheist characters, some revolve around the conflicts of atheists with religious believers and religious institutions, and — to make the definition even looser — some that I’d classify as atheist (more accurately, atheist related) simply critique religion and religious institutions. The following books do not comprise anything approaching a complete list, even using that loose definition of atheist science fiction. They’re merely the best atheist and atheist-related sci-fi novels that I’ve come across. The Handmaid’s Tale. (1985) More speculative social fiction than science fiction, The Handmaid’s Tale is Atwood’s horrifying vision of what would happen to America, and especially American women, if fundamentalists seized power. Anti-fundamentalist and antiauthoritarian, but not specifically atheist. Atwood’s Maddaddam Trilogy is also well worth a read. Oryx and Crake (2003) bears not at all on religion, but rather on rapacious corporate capitalism and the evil uses to which it could put technological developments in the pursuit of profit. The Year of the Flood (2009) is set inside a believable, intricately described religious/ecological cult, and continues describing the socio-politico-economic problems carried over from Oryx and Crake. Maddaddam (2013) has still more on the matters dealt with in the first two books, but also looks at the extreme measures necessary to avoiding detection in an all-pervasive surveillance state. It also features biting and insightful passages regarding the sleaziness and hypocrisy of fundamentalist religion. All three books in the trilogy are masterfully written and quite entertaining. The following are Banks’ “Culture” novels–space opera on a grand scale. While set in the same universe, all work as stand-alone novels. All are set in a galaxy-spanning, far-future atheist and anarchist society, where religion pops up only when there’s an “outbreak” of it somewhere. All of the Culture novels feature strong, believable characters (including AIs), complicated ethical dilemmas, and frequent dark humor. Of them, the two best are probably Player of Games and Surface Detail, and the weakest is probably The Hydrogen Sonata. The one that has the most to do with religion, revolving around the sheer viciousness of many religious believers, is Surface Detail; religious fanaticism and the ills it produces also features prominently in Consider Phlebas. The Crucible of Time (1983). An inspiring novel about the rise of science and its eventual triumph over religion in an alien society. Protectorate (1985). Deals with cults in the context of authoritarian government. Not one of Farren’s better novels, but worth reading if you can find a copy for a buck or two. Their Master’s War (1987). An entertaining page-turner concerning militarism, imperialism, and religious manipulation. The Armageddon Crazy (1989). An all too timely and at times quite funny novel about a fundamentalist takeover of the U.S. government. Probably Farren’s best sci-fi novel. Galactic Rapture (2000). Deals almost entirely with the harmful effects of religious belief, irrationality, and gullibility. The high points are the detailed descriptions of “psychic” scams. Code of the Lifemaker (1983). Very entertaining, very funny. A sharp look at a questioning attitude and rationality vs. credulousness and irrationality, with some sections exposing how “psychics” gull their victims. Probably the best sci-fi novel ever written about the conflict between science and religion, and definitely the funniest. 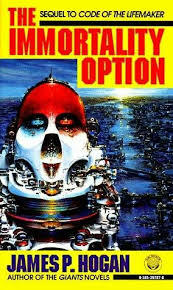 The Immortality Option (1995). The sequel to Code of the Lifemaker. Well worth reading, but only after reading Code of the Lifemaker. It’s almost as funny as its predecessor. The Jehovah Contract (1987). A noir-comic — to use the current term, “urban fantasy” — novel about the conflict between good and evil, where good is personified as a hit man who has a contract to take out evil, personified as The Almighty. The Night Sessions (2008). A perceptive near-future look at the menace of religious fundamentalism. Intrusion (2012). A frighteningly plausible dystopian novel of an all-pervasive surveillance state. A modern 1984. The protagonists are both atheists, and the novel in part revolves around their conflicts with religious “nutters” and religious privilege. Blameless in Abaddon (1996). This is more fantasy than science fiction, but it’s worth including nonetheless. The second book in Morrow´s Godhead trilogy, Blameless in Abaddon revolves around the unstinting efforts of a terminally ill cancer patient to put God on trial at the Hague for crimes against humanity. It’s very dark, but very funny. I’ve read the other two books in the trilogy, Towing Jehovah (1994) and The Eternal Footman (1999) and would not recommend them; fortunately, Blameless in Abaddon works as a stand-alone novel. Morrow has written a number of other atheistic novels and story collections, such as Only Begotten Daughter (1990) and Bible Stories for Adults (1996); I wouldn’t recommend them for the same reason I wouldn’t recommend Towing Jehovah or Eternal Footman: they’re satires, but I didn’t find them funny. The one other book of Morrow’s I would recommend is the philosophically oriented City of Truth (1990), the first portion of which is downright hilarious. Blasphemy (2007). A cross between a near-future high-tech thriller and a Tony Hillerman mystery, Blasphemy features two strong, very well described fundamentalist-preacher characters, one a sleazy, wealthy televangelist (drawing on Jerry Falwell, Jimmy Swaggart, and Robert Schuler), the other a dirt poor, ignorant, vicious fanatic. If you like both thrillers and the Hillerman novels (set on the Navajo Reservation), you’ll probably love this one. Galileo’s Dream (2009). A well executed time-travel novel involving Galileo and his conflict with the Catholic Church and the Inquisition. The Apocalypse Codex (2012). An oftentimes funny, genre-bending (sci-fi/fantasy/horror) novel about a prominent televangelist, Christian fundamentalism, slithering necromantic horrors, and “applied computational demonology.” Although part of the Laundry Files series, this works as a stand-alone novel, though you’ll enjoy it more if you first read the previous highly entertaining books in the series; the first is The Atrocity Archives (2004). The Delirium Brief (2017). The primary characters from The Apocalypse Codex, and the related fundamentalist and necromantic monstrosities, reappear in this latest Laundry Files novel. There were two intervening novels in the series between these two, and it’d be a good idea to read The Apocalypse Codex before tackling The Delirium Brief; it’d be a better idea to read all of the prior Laundry Files books, as there are many references to events in the previous novels. Kalki (1978). A terrifying look at religious fanaticism and the use of biological WMDs. Live from Golgotha (1993). A short comic time-travel novel about live TV coverage of the crucifixion of J.C.
Mysterium (1994). A perceptive, well written novel about an alternate-reality American religious police state, and the casual arrogance, self-righteousness, callousness, intrusiveness, and brutality of those who run such religious states. Also deals with the evil of blindly following orders rather than following your own conscience. Re-Birth (1955). A nicely written early post-apocalyptic tale of religious ignorance, arrogance, and brutality, and escape from it. Zeke Teflon, compiler of this list, is the author of Free Radicals: A Novel of Utopia and Dystopia, which deals in large part with religious and political cults. CONFIDENCE, n. The emotion you feel when you don’t understand the situation. This is the sequel to Hogan’s amusing and insightful Code of the Lifemaker, which we reviewed in June. It takes up where Code of the Lifemaker leaves off, with the Taloid mechanoid civilization on Titan, the mutant spawn of a damaged interstellar alien probe a million years ago, temporarily saved, but still under both internal threat from religious and political authoritarianism, and under external threat from GSEC, a rapacious Earth-based corporation. The cast of characters is mostly the same as in Code of the Lifemaker. Like that book, this sequel is a combination of hard sci-fi and social sci-fi, and the political and social subtext is essentially the same: that science, free inquiry, and free expression are essential to progress, and that religion is inimical to progress, and its practitioners often irrationally and sadistically cruel. What’s new in The Immortality Option is the revelation of where the interstellar probe came from that set off the explosion of mechanical evolution on Titan: the Borjilans, an avian-descended race from a star a thousand light years off. The description of that race and their ultra-competitive civilization is highly amusing. From reading it, I strongly suspect that Hogan was at least somewhat familiar with avian behavior; here, he focuses almost exclusively on its negative, darkly comedic aspects. The one real problem with Hogan’s description of the events leading up to the launching of the probe is that it hinges on a cover up of an existential threat to the Borjilan home world that would be impossible to hide in any even remotely open society. That’s unfortunate, because there were ways Hogan could have avoided this implausibility. But he didn’t, and at least the chapters on the Borjilans are so intricate and amusing that it’s fairly easily to overlook the implausibility of the pivotal cover up. Without giving away too much, The Immortality Option deals largely with the encoded personalities of one the Borjilans (especially Sarvik, the primary Borjilan character), the pompous scientist (Weinerbaum, a new character) who discovers them, GENIUS, an AI created by Sarvik, and the machinations of the Borjilans and the Taloid priests and authoritarian politicians, and their rational foes among the Taloids and “Lumians” (humans). While probably not as good a book as Code of the Lifemaker, The Immortality Option is still a lot of fun in its own right. Recommended — but do yourself a favor and read Code of the Lifemaker first. When the Huygens probe descended to the surface of Titan in 2005, I was bitterly disappointed. I’d been irrationally hoping that it would deliver images of the exceedingly strange mechanoid civilization and environment that the late science fiction author James P. Hogan vividly describes in his 1983 novel, Code of the Lifemaker. But no. All the probe returned was a bonanza of scientific data. In Code of the Lifemaker, Hogan achieved something difficult: a successful synthesis of hard science fiction and social science fiction. He devised a well developed, unique setting for the story, and in the story he examines questions such as what makes us human? does god exist? what is the role of religion in society? what is the role of science in society? Despite delving into these heavy questions, the tone of the novel is light, and in places it’s very funny. Most of the book’s events take place beneath the impenetrable (to telescopes) clouds of Titan, where a million years ago a radiation-damaged alien ship set off an automated, runaway explosion of technological development–extraction processes, factories, machines of all types, robots–all controlled by badly corrupted software. The end result was the evolution of a very complicated mechanical ecology, whose development Hogan describes in a lengthy prologue (10 pages!) that’s entertaining despite being pure exposition (what sci-fi writers often describe as an “infodump”). This unique ecology is inhabited by the Taloids, sentient robots, who are remarkably human in thought and action, who are at approximately a Renaissance level of social and political development, and who understand their mechanical ecology no better than Renaissance humans understood their biological ecology. The action begins with a joint government/corporate (General Space Enterprises Corporation–GSEC) mission to Titan consisting of scientists, government functionaries, a military contingent, corporate tools, and, as part of the GSEC p.r. campaign to sell the exploitation of Titan, one of the novel’s two protagonists, the famous psychic, Karl Zambendorf. (The other is the Taloid scientist and victim of religious persecution, Thirg The Questioner.) Once at Titan, the expedition quickly establishes contact with the Taloids and conflict commences in the Earth delegation between those who would enslave the Taloids and those who would assist them, and on the Taloid side between the budding scientists and their version of the Inquisition. While scientific discovery has rendered impossible the setting of Code of the Lifemaker, its treatment of the many philosophical, scientific, and religious questions it raises remains as timely as when Hogan wrote the book over thirty years ago.